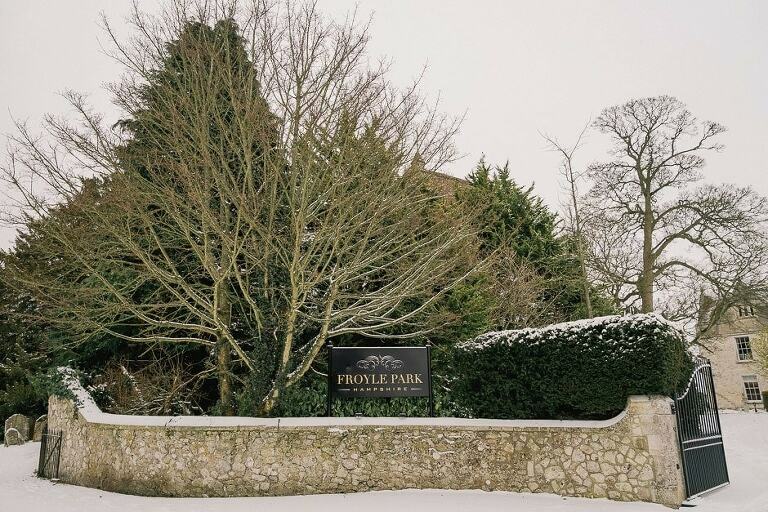 Froyle Park is a classic and elegant wedding venue situated in the lovely village of Upper Froyle in North-East Hampshire. The beautiful Jacobean manor dates back to the early 1700s and features immaculately manicured grounds that always make for fantastic backdrops. Claire and Andy are a great couple who got married here in March and with heavy snow forecast, I was so excited at the prospect of my first white wedding! Sure enough the snow settled and Alicia (my second photographer) and I arrived in Upper Froyle well ahead of schedule anticipating travel problems in the morning. We managed to drive all but the last half a mile where my rear wheeled drive car couldn’t make it up the slippery hill and to save us trekking with our gear the very kind local landlord offered to drive us the rest of the way in his 4X4! Froyle Park looked absolutely magical in the snow and with the water fountains completely frozen over this made for some fantastic images of the grounds in the morning. I headed up to capture Claire getting ready whilst Alicia met Andy and the boys. The registrars had trouble getting to the ceremony and running over an hour late the couple eventually exchanged their vows in the Great Hall in the afternoon. Claire and Andy were really keen to make the most of the snow and we took them around the white grounds for a relaxed couple shoot complete with icicles and wellies! The wedding breakfast took place in the magnificent Grand Ballroom and afterwards we went outside to capture Claire and Andy with the snow falling under the beautiful twilight sky. It was an amazing day with several challenges to overcome but we came away with some amazing and truly memorable images………. As always it was great to work alongside the very talented Stephanie Dorrelli who did Claire and her bridesmaids’ hair and make-up in the morning, you can find her website here.